Oregon, officially nicknamed as ‘The Beaver State’, is located in the Pacific Northwest in the United States of America and is best known for its magical landscape. From forests to beaches, mountains to farmlands, and volcanoes to deserts, the state is known to be among the most diverse in the country. One of the only three out of the 48 contiguous states of America to be on the coastline of the mighty Pacific Ocean, Oregon is known for a lot of intriguing attractions and elements such as the Crater Lake – the deepest in the U.S., Armillaria Ostoyae – the world’s largest single organism, and ghost towns – more than any other state in America! 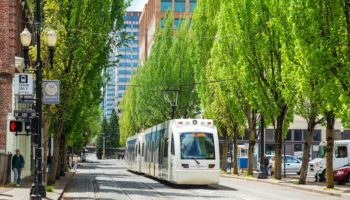 Now, of course, you know about the famous cities of Portland, Salem, and Eugene but did you also know that the state of Oregon is home to a bunch of small, picturesque towns which could give the big towns a run for their money? Here are our 12 most scenic small towns in Oregon. What could a town with just over 1,000 residents possibly have to offer you as a visitor? Well, for starters, the town, nicknamed “Oregon’s Little Switzerland,” is host to a Swiss-Bavarian carnival that resembles Oktoberfest (Yes! The one in Germany that includes lots and lots of beer) but only because it also involves alpenhorn and a lot of yodeling. For outdoor enthusiasts, Wallowa Mountains and Eagle Cap Wilderness are great opportunities to get out and hike amidst nature. Alternatively, you can take the town’s tram and enjoy the stunning surrounding scenery. 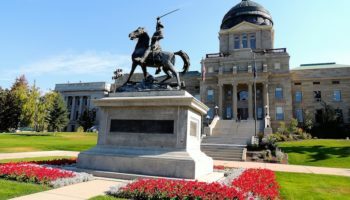 Considered as the “Queen City of the Inland Empire” during the 19th and 20th century, Baker City was once as populous and prominent as the likes of Portland and Salem. Though not so much anymore, the beautiful and peaceful town is perched along the historic Oregon Trail and is a famous stopover for bikers during the yearly Hells Canyon Motorcycle Rally. Visit the National Historic Oregon Trail Interpretive Center and the Baker Heritage Museum to get acquainted with the town’s celebrated past. Or, grab a local beer at the Baker City Brewing Company. 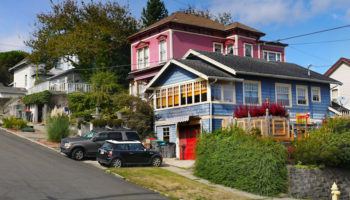 While not as popular on the tourist trail as the Italian city by the same name, Florence in Oregon is definitely not without its own charm. 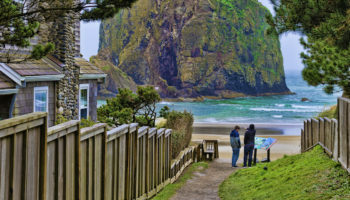 This little town of Florence offers an impressive coastline, mind-blowing vistas of nature and the ocean, miles of sand dunes within the Oregon Dunes National Recreation area, captivating Sea Lion Caves, a picture-perfect Lighthouse, and a Hobbit Trail! If all this isn’t enough then there are, of course, a nice selection of shops and diners to enjoy. Another true small town (with less than 2,000 citizens) made famous in the 1980’s movie Stand by Me, Brownsville makes it to almost all the lists of “best small towns in Oregon for visitors”. 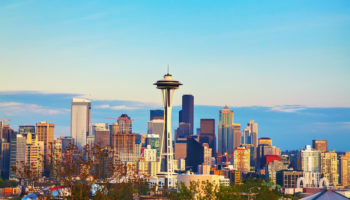 What the city lacks in terms of population, it makes up for in its lovely natural landscape which lets visitors disconnect from the outside world. Founded in 1846, the town has surprisingly managed to preserve much of its glory and architecture from the old days. Walk around the historic downtown to gawk at structures that date as far back as the 18th century. For history buffs, a visit to The Moyer House is a must. The county seat of Yamhill, Oregon McMinnville is a town different from the other picturesque towns you have read about so far. Most of the town’s structures were built between 1885 and 1912 and have been well-preserved. In fact, the town’s historic district, a nine-block area with about 64 remarkable edifices, is where you should be spending most of your time. Nestled in the heart of wine country, McMinnville is quite a hit among wine lovers. With more than a dozen wine tasting rooms and restaurants, McMinnville is your Oregon small town to sample the delicious wines grown in the many local vineyards. Pay a visit to the Evergreen Aviation and Space Museum to admire the largest propeller-driven seaplane, Spruce Goose. And, if you are a fan of extraterrestrial activities, attend the annual UFO Festival that takes place every May. The ‘covered bridge capital of the west’, Cottage Grove is home to not one but six covered bridges and has a yearly festival dedicated in their honor! Chambers Railroad Bridge, one among the six, is the only of its kind to exist west of the Mississippi River. The lovely downtown district is home to several historic structures, splendid art galleries, boutique stores, and wonderful cafes. Explore the history of gold mining in the area at the Bohemia Gold Mining Museum and wander to spot the stunning murals scattered across the town. For something slightly more adventurous, take up cycling, hiking, or even horseback riding which are all available at Cottage Grove. How does a town with such a small population become so popular with visitors to Oregon? We’ll tell you. Once a military post, Sisters is named after the Three Sisters Mountain that surrounds the town to the west. Sisters provides easy access to nature, we recommend hiking the McKenzie Pass, climbing up to Sahalie and the Koosah Falls or visit the Deschutes National Forest. If you feel like some pampering and self-love, spend a day at the Shibui Spa. And when this is all done, shop at one of the artistry boutiques and grab a cup of creamy coffee at Sisters Brewing Company. 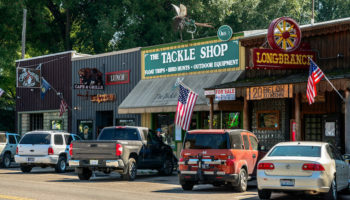 Once known as Linkville, Klamath Falls is pure bliss for those who want to spend some time off from the hustle and bustle of city life. Think of hiking along the river, taking a boat tour with your loved ones, and walking through Sky Lakes Trail! 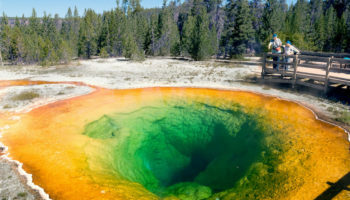 The small town is known to play host to a number of recreational facilities such as a golf course, an ice skating arena, a canoe trail, and a large number of flora and fauna for the nature lovers among you. For a nice evening in the town, head over to the Creamery Brew Pub & Grill for a great meal and refreshing drinks. 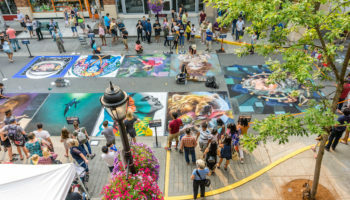 Located right off the California border, Ashland is a beautiful little town in the Rogue Valley which is known for its peaceful atmosphere and many art galleries that are scattered around the town. Founded in 1852, the town is home to the Oregon Shakespeare Festival and the Southern Oregon University – two important landmarks in the town. Visit the art galleries and many shops that are the prime highlights for tourists but also visit the National Fish and Wildlife Forensics Laboratory – the only laboratory of its kind in the world to fight for crimes against wildlife! If you are an outdoorsy person, hike up Mount Ashland for an adrenaline rush. With a population of slightly over 7,000 residents, Hood River is famed as the Windsurfing Capital of the World – isn’t it already your dream town! 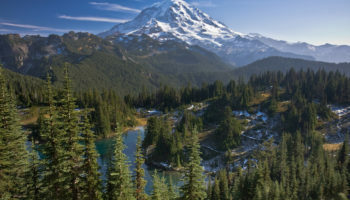 Highly popular amongst hikers, wind surfers, bikers, and skiers, the town offers easy accessibility to the majestic Mount Hood as well as the magnificent Columbia River. The town was incorporated in 1895 and was named after the nearby namesake river. Tourism and recreation sports are two of the major businesses here. Hood River hosts a variety of festivals and carnivals throughout the year and we recommend timing your visit accordingly, especially the Hood River Valley Harvest Fest that takes place every October. Or, you could come to participate in the Annual Gorge Games. Nestled on the banks of the Columbia River, Astoria is named after a New York investor, John Jacob Astoria who is accredited with establishing Fort Astoria some 207 years ago. Spend time retracing steps back to the time of Pacific Northwest’s exploration or admire the wilderness at the State Historic Parks. If you prefer history over nature, visit the Heritage Museum for a nice afternoon. And, if you plan to hike up the Young River Falls, don’t forget to bring your camera to capture the epic views. 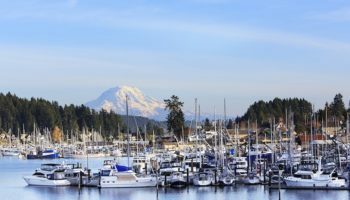 There are several other points of interest in the town but for a tranquil evening, visit one of the hotels or restaurants by the pier and enjoy a gorgeous view of the Columbia River. 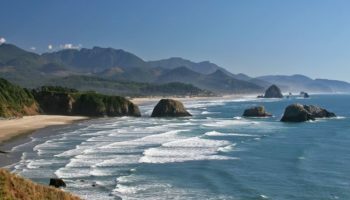 A charming small town in Oregon in the truest sense, the town of Cannon Beach with a population of less than 2,000 inhabitants is most famous for being so close to the prominent Haystack Rock – one of Oregon’s most distinguishable landmarks. The second most-famous thing in the town is, of course, it’s long stretch of sand and sea. 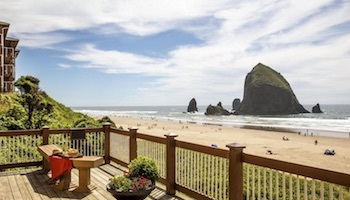 For tourists arriving or staying in Portland, Cannon Beach is often a great weekend getaway destination. While you’re here, have a meal at Cannon Beach Hardware and Public House and don’t miss the 1.5-mile hike from Ecola Point to Indian beach.